As many readers of this blog are surely more than familiar, this week a new state law went into effect to reduce California’s prison population by 6,500 inmates over the next year. Southern California Public Radio (KPCC) provides a balanced overview of the issues raised by the reforms, interviewing the LAPD union chief, who predicts the plan will undermine public safety by releasing dangerous offenders back into communities, as well as Stanford Professor Joan Petersilia, who argues that the plan will actually make Californians safer by better focusing resources on high-risk offenders. Meanwhile, Gov. Schwarzenegger’s floating a proposal to start sending inmates to Mexico, and a local sheriff pleads: “Local jails cannot bear burden of housing state prison inmates.” Of course, the California Corrections Crisis blog, run by professors and students at the UC Hastings law school, remains an indispensable resource for following these and other developments in the Golden State. Since many of my readers are far more expert than I on these issues, I won’t belabor the details here, but after the jump, I’ll provide a bit of background for readers less familiar with California’s prison system. 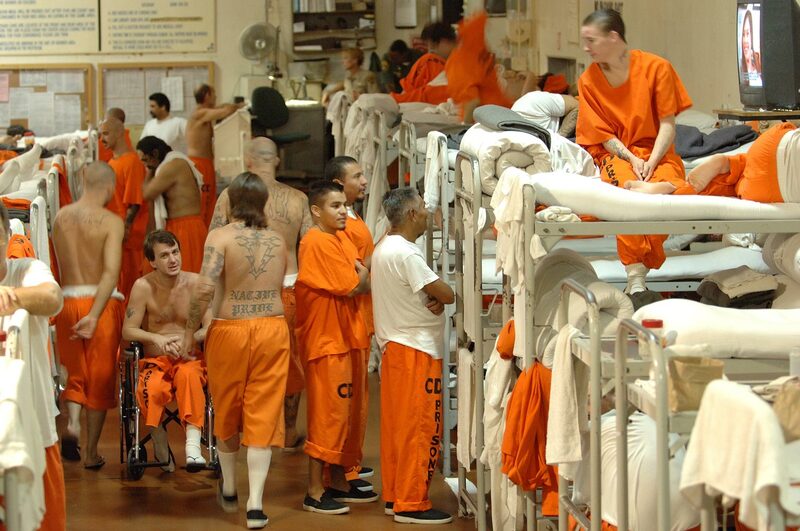 It’s hard to overstate just how overcrowded California’s state prisons have become. Since the mid-1970s, California’ prison population has increased 750% and the prisons are now packed to about 200% of their capacity. As a result — among other things — it is extremely difficult for prison officials to manage and provide basic health care services to inmates. A U.S. district judge found in 2005 that a California inmate dies needlessly every 6-7 days due to deficient medical care. The federal district court gave California two years to come up with a plan for cutting the number of inmates by about 40,000, or down to about 137% of design capacity. The U.S. Supreme Court has so far declined to intervene, so the federal court order remains in effect, and Gov. Schwarzenegger has been working out a proposed plan under the court’s supervision. Meanwhile, as part of last year’s budget package, the California Legislature passed, and Gov. Schwarzenegger signed, Senate Bill 18XXX, the Corrections Reduction Bill. This law aims to decrease the state’s prison population by 6,500 inmates over the next year, not only to alleviate overcrowding but also as a cost-cutting measure. The law doesn’t actually provide for the immediate release of any prisoners per se (an earlier version of the bill that would have immediately released 6,300 elderly and infirm prisoners didn’t pass), but implements a set of corrections policy reforms that should have the effect of reducing the prison population. Indeed, some prisoners have already been released from county jails as a result of the law’s changes to how good-time credits are calculated. The key to understanding these reforms, and part of why California has an overcrowding crisis to begin with, is that California handles parole differently than virtually any other state. Currently, every single inmate, upon release from a California state prison, is placed on parole for up to three years. (Note: This is a way of saying they remain under the supervision of a parole officer — it doesn’t mean they’ve been “paroled” in the sense that they’ve been released early, since 95% of California inmates serve determinate sentences. Here’s a primer on how California parole works.) And that means they can be sent right back to prison if they violate any of the long list of standard parole conditions: if they commit a new crime, but also if they fail a drug test, or just forget to update their address. At any given time parole violations are the reason why 60,000 to 70,000 of California’s prisoners are behind bars (out of a total prison population of about 170,000). The law is expected to decrease the prison population by 6,500 over the next year, and save about $500 million. Parole agents will take advantage of their lower caseloads to focus more intensively on high-risk violent and sexual offenders. Prisoners will be able to shave time off their sentences by participating in rehab or education programs. i am requestin info about the state of oklahoma and how the bill can help imates being over crowded.i need to know about the bill in detail who is being considered for early release to elimate the over crowding issues at hand?how can a imate find out if they have the possibilities of being a canidate?i know for a fact that the imates at lawton corrections facility have been on lock down since around christmas and it is now feb.15th,2010 due to some race war it’s so crowded there the tension is so high that everyone is suffering….what can be done???? ?